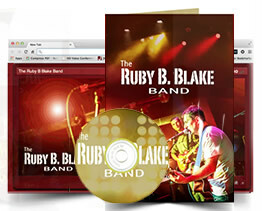 An EPK, matching web-page, domain name, CD design and a 50 Print Press kits for $450 (free shipping). The perfect starter pack at the perfect budget. Go full service or do-it-yourself! Kits start at just $7.95. We also offer Full Service; we'll set your EPK up from start to finish in just 3-5 business days. Resell marketing services to your artists or clients. Set your own price, we do all the heavy lifting. With our new turn-key white label program, it's never been easier! We're more than just writers, designers and web developers! We're trained musicians and professional marketing experts who tie it all together for YOU under one roof. If you'd like one phone number to call for all your marketing needs, a friendly and gifted team you can count on, flexible payment plans, phone calls and e-mails returned promptly, and stellar products, then give us a call. "That is fabulous!!! You guys are theeee BEST!!!! It really has been a pleasure working with people who are soooo on top of everything, answer all my questions, and are so professional. In today's world, that's rare, unfortunately! So glad I found you! Thanks for everything." "Thank u so much for all of your help and I really really appreciate the knowledge and your honesty." Copyright © 2009-2014, Jonas Music Services.